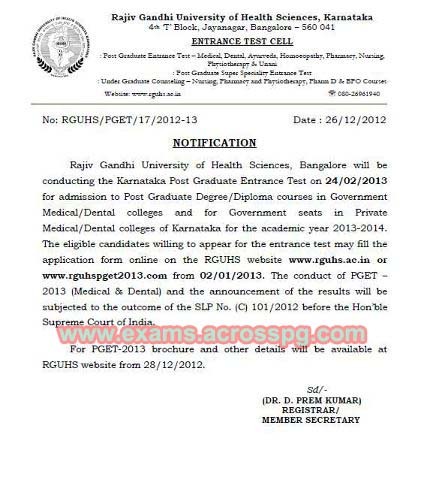 Karnataka PGET 2013 for admission to MD/MS Notification - AcrossPG Exams! Rajiv Gandhi University of Health Sciences, Bangalore will be conducting the Karnataka Post Graduate Entrance Test on 24/02/2013 for admission to Post Graduate Degree/Diploma courses in Government Medical/Dental colleges and for Government seats in Private Medical/Dental colleges of Karnataka for the academic year 2013-2014. The eligible candidates willing to appear for the entrance test may fill the application form online on the RGUHS website www.rguhs.ac.in or www.rguhspget2013.com from 02/01/2013. The conduct of PGET – 2013 (Medical & Dental) and the announcement of the results will be subjected to the outcome of the SLP No. (C) 101/2012 before the Hon’ble Supreme Court of India. For PGET-2013 brochure and other details will be available at RGUHS website from 28/12/2012.